I thoroughly agreed with Julie Wright from Wright On Communications when she wrote about the overuse of the word “excited” in press releases. As she puts it, if you’re “excited” about something, go tell your mom, don’t submit a press release. That got me thinking about other overused words in the titles of life science press releases, ones that point out that the item is not newsworthy. Today, everyone can easily send a press release, and that means that everybody does. We are all for you DIYing your life science public relations, and here we present the top 5 words you should avoid to get your press release noticed by journalists, search engines, and ultimately your audience. You may know that we founded and manage the San Diego Biotechnology Network, and we offer an automated news feed which appears on the website, Twitter, and email. In order to automate this feed, our tools must filter out press releases that are not newsworthy. To find the overused words, we created a word cloud using the titles of 1300 releases collected over the past 8 months, it is shown below. 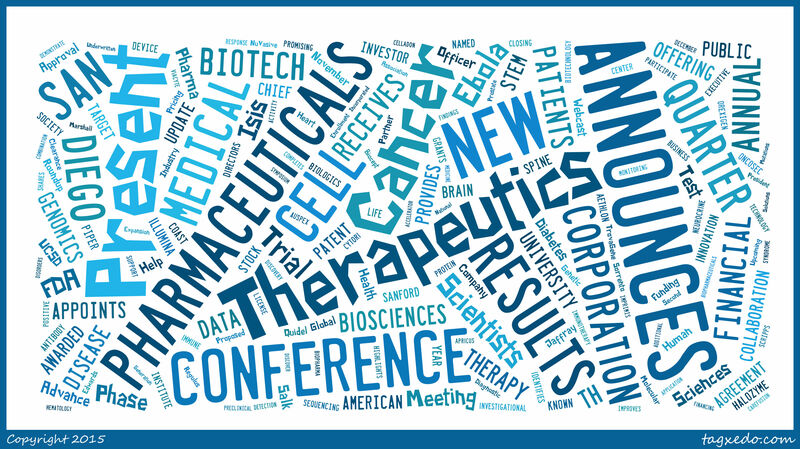 Several of the top words used in life science press release titles are understandable and useful, but several are problematic as they represent non-newsworthy items. Below, we share the top overused, generic terms as well as suggestions for replacing or rethinking the content of the press release. Appoints. This word is used to announce an addition to staff, and these releases should be used very sparingly, and with purpose. Focus on what’s newsworthy, and what this person will bring to your organization. Not sure? It’s a good idea to determine the significance, otherwise you don’t have a newsworthy press release. Below is shown an example of how a release title can be changed. Announces or Reports. These terms are just plain redundant. Of course you’re announcing or reporting something in a press release, but what makes it newsworthy? Below we share an example of how you can craft a newsworthy release about information you’re announcing. Also, be sure that your regulatory and legal group are on board with the release well in advance, as FDA and SEC standards must of course be met. If they don’t agree with your positioning of the news, maybe you should hold off on sending the release rather than to send a watered down version. Of course, in some cases, your company is obligated to announce events such as earnings calls, so some “boring” releases may be necessary to comply (and we urge you to even make these releases as informative as possible). Presents or Conference. Your company is presenting at a conference, congratulations! Many companies that make such an announcement are paying to present, further diluting this “news.” Again, if your company is publicly traded, you may need to announce this event to comply with SEC regulations, but we see many private companies using a conference presentation as an excuse to send a non-newsworthy press release. These types of announcements are more well suited to your website, as people who are interested in investing in your company will likely be following it closely. Those who are already going to the conference will be made aware of your presentation, so there is no need to publicize it. An exception would be if you’re planning to make the presentation available online to those who may have a more casual interest. Even better? Post an update on the conference after the fact, indicating how your presentation was received, along with other important findings from the event. What’s the significance of optimizing your press release title? Besides catching eyes, helping you to craft a newsworthy release, and helping readers understand your news, you’ll also get better search engine optimization (SEO) with a meaningful title. It will be the only part of your release that the vast majority of your audience will read, the “sound bite” that they will remember. Rather than sending a larger number of generic releases, consider quality over quantity in your life science public relations. 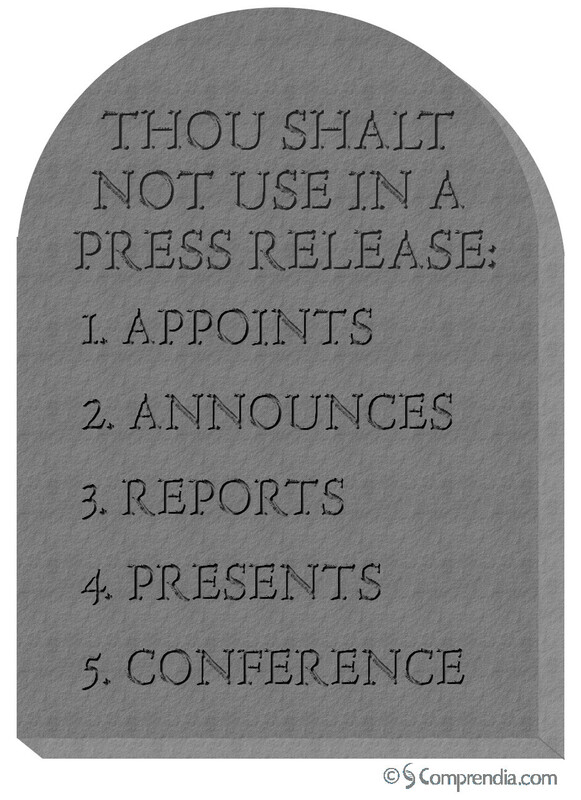 While we won’t promise that these commandments are the complete guide to success, we hope that they help you to think differently about press releases, writing them in a way that is more effective in helping you meet your goals.